Pressure cooking has been in vogue for a long time because of the many benefits associated with it. One of the fastest and easiest ways to cook delicious meals is by using a pressure cooker. There are stove top pressure cookers and electric pressure cookers. These cookers come in several sizes. To know which the best cooker for your family is, you will need to rely on a good pressure cooker review. Electric pressure cookers have an edge over stove top ones because you can just switch them on and forget about them. Yes, it’s that simple; all you need to do is to change the temperature and pressure level on the cooker and switch it on. The Power Pressure Cooker is the latest rage in the home appliances market. This electric cooker claims to cook food 70% faster than the traditional methods. 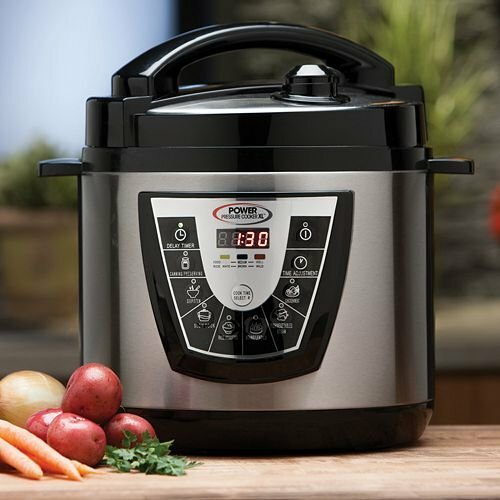 Based on several power pressure Cooker XL reviews we have listed down the best features and the not so good features of this product. Performance: The cooker’s performance is noteworthy as each and every meal is well cooked and with minimal effort. When compared to the other traditional cookware and cooking techniques, you can cook almost 70% faster and more efficiently with this electrical pressure cooker. Clear Display Panel: The display in the digital control panel is clear and it is easy to follow. Depending on which cooking mode you select the display panel will show the time; this can be increased or decreased according to your taste. Once the cooking is done the cooker will switch to the keep-warm mode. The Display panel also shows error messages when the cooker doesn’t work properly. Larger Capacity: It is one of the fastest ways to cook up to 6 quarts of a dish quickly and easily while retaining all the nutrients. This way you can effortlessly cook for a large family. Lid safety device: It prevents pressure from building up if the lid is not closed properly. Back-up Safety release valve: This valve’s main function is to release pressure when the temperature or pressure sensor malfunctions. Safety pressure release: This is another safety measure to release excess pressure when other safety measures fail. Temperature cut-off: This device automatically shuts down the cooker if it gets overheated. Easy to use: There are several preset cooking modes in this cooker; as result, just with the touch of a button you can whip up delicious and different meals each time without too much effort. Removable power cord: It is easy to store the cooker when the power cord is easy to remove. Ergonomic Handles: The cooker comes with ergonomic handles that are durable and are heat resistant making it easy to lift the cooker or its lid comfortably. Easy to clean: You can wash the inner pot either by hand or in a dishwasher quite easily. The display panel too can be cleaned of any spills by wiping with a damp sponge. Poor Customer service: The Customer service of a company is its backbone and has to be strong if the company decides to retain its customers. Sadly according to several power pressure cooker xl reviews their customer service is pathetic. Frustrated customers have complained of clueless representatives who have practically no knowledge of the product. Then there are also issues with unanswered emails and long waiting time to receive any kind of support. Pressure takes too long to build: The instruction manual claims that the pressure will build in 17 minutes but users have found that it take much longer and at times even 25 minutes. Very short warranty: All the customers feel the 60-day warranty is really short and does not serve the purpose it is meant to. Several reviews state that several units have malfunctioned soon after the warranty expired. Unfair replacement conditions: In the event your cooker malfunctions within the warranty period you can get a replacement but you will have to pay both ways shipping charges. This is unfair according to several irate customers on power pressure cooker xl reviews. Poor quality Teflon coating: Another incessant complaint from users is that the Teflon coating wears off in no time and starts peeling. This is toxic. The poor quality Teflon also means the non-stick feature is also not functioning. Poor instructions in the manual: The instructions are not clear and hence are not helpful to a newbie to pressure cooking. People have no clear instructions on how to replace the silicone seal and how to release the steam before opening the lid. Expensive replacement silicone ring: The silicone ring eventually becomes loose and then the steam will leak and pressure cooking becomes ineffective. Hence you need a spare always but it is really expensive and is available only on the XL website. How is the Power Pressure Cooker better than others? According to several power pressure Cooker XL reviews and customer feedbacks on various sites, it is evident that the PPC has some distinct features that make it stand out and special. Let us see what these features are. Flavor Infusion technology: This is a unique technology wherein the steam filled with the nutrients and the aroma released from the food that is being cooked is trapped within the cooker before being allowed to enter the dish naturally. This way not only is the dish delicious but also nutritious with minimal loss of all the essential vitamins and minerals. Several Cooking Modes: In this one pot you can make several dishes like pasta, stews soups, rice, vegetables, meat, and fish. Just click the preset mode and you are done. Of course, a little trial and error is required to make dishes in accordance with your consistency and firmness. Delay timer: This feature enables you to set the timer and delay cooking a dish for a later time when it will be hot and fresh. It is especially advantageous when you need to step out; you can come back to a meal which is nicely hot and freshly made. From the above pressure cooker xl review it is clear that the Power Pressure cooker is a very valuable addition to your kitchen should you decide to buy it. Unlike the several products which look very appealing on television but actually fail to live up to the tall promises made on screen, this PPC actually does what it claims to do. This appliance is not only affordable but also saves time and effort. Of course, there is negative feedback also about burnt food, Teflon coating of not good quality and a warranty that is short lived. A few of the drawbacks can be overcome if all the instructions in the manual are followed properly. In case you are not convinced about the quality of the product do more research, ask the manufacturers questions and finally take the call. Remember all appliances need to be used according to the manual and have to be maintained properly. But for now, we can safely say that the power Pressure Cooker XL is a good buy and will definitely enhance your cooking experience. Without much ado get your own power pressure Cooker and take another step towards healthy living and eating. 2.1 How is the Power Pressure Cooker better than others?